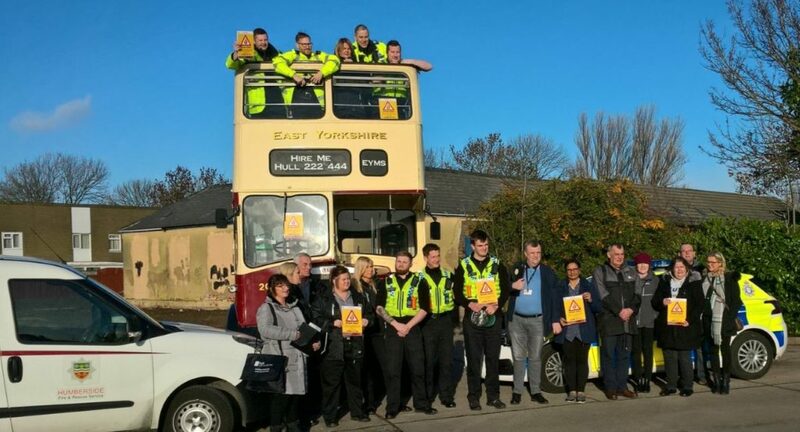 Officers from the east Hull neighbourhood policing team are taking part in a 16-month long multi-agency initiative to cut down on burglary and improve fire safety in Hull. They’ve been working closely with departments within Hull City Council, teams from the charity Neighbourhood Network and Humberside Fire and Rescue Service. The common aim of all the agencies involved is to pass on information to residents about how to protect themselves from burglary and antisocial behaviour, tips on how to make their homes and property more secure, as well as fire safety. Residents have been advised on how to make their homes more secure by property-marking personal items, fitting free PIR motion detection alarms in outbuildings such as sheds & garages, as well as fitting warning signs. A full fire survey was completed on all the homes visited, which included checking smoke alarms and homes for any signs of risk to fire. The initiative has up to now been rolled out across The Garths on Bransholme and the Castle Grange areas of Hull. The team are going into other parts of the city soon and doing the same. PC Steve Hepworth the east Hull neighbourhood policing team community beat manager said: “The whole idea behind this to work together with our colleagues to help reduce crime, particularly burglary, before it happens. “The figures are fantastic and clearly demonstrate just how effective partnership working is and how much we can achieve when we all come together.